had a magnificent and spacious acropolis. Homer described it as very steep, or ‘beetling’. would not march up to the bottom of the cliff face and try to climb up in front of the walls. Instead, it would first establish itself on the plateau at the same level as Hisarlik, and then attack, aiming to push the Trojans over the ridge and down the steep hillside to the plain below. Yet there is no hint in the Iliad of such a strategy being even considered. Homer’s acropolis was large enough to have within its walls many fine buildings. These included the royal palace, temple precincts, other houses for members of the royal family and their servants, stables for horses, and buildings and store rooms for food, animal fodder and military equipment. The so-called walled ‘citadel’ at Hisarlik is much too small to be the walled acropolis of Ilios. Also, the nature and extent of the so-called ‘lower town’ at the time of the Trojan War has been much disputed. view from the site suggests that Priam’s city was settlement level 7a, which ended by fire. According to the archaeologist Carl Blegen it lasted ‘half a century at most.’ Neither levels 6h or the one above it, called level 7a, agree with the legends. These suggest that Troy was established only about 5 generations before the Trojan War. At the end of the war it was destroyed by fire. Bay, near the mouth of the river Mendere. The Trojan War was fought on the plain between there and Hisarlik. However, between 1980 and 1982, ground surveys showed that a large bay existed at the river mouth in Trojan times. Troy at Hisarlik was therefore effectively a coastal fortress. 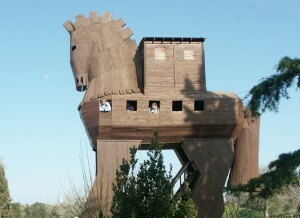 Troy in the Iliad, on the other hand, was described as ‘far from the ships’. makes a mockery of this great epic poem. descriptions of the plain in the Iliad. and destroyed Teuthrania thinking it was Troy. built Ilios on the high acropolis nearby. This valley was known as Mysia to the ancient Greeks. Archaeologists have yet to confirm the exact location of ancient Teuthrania. Teuthrania is in the same valley as Pergamon and Bergama, some 150km away from Hisarlik. 10. The main river in the wrong place. is nowhere near the mouth of the Mendere.